My World My Way is a new role playing adventure for the Nintendo DS. Did the adventures of Princess Elise leave us smiling or pouting? The star of My World My Way is Princess Elise. Being a princess, she's used to getting everything her own way. The prettiest dresses, the biggest parties and the best toys, Elise had it all. That is until she became a typical teenager. Now, the demanding princess demands the most handsome boy in the kingdom to take as her boyfriend. Her father the king throws her a great big party where she meets the most handsome young adventurer. Rather than marry her for her money and status however, he quickly dismisses her. Flabbergasted at not getting exactly what she wants for the first time in her life, Elise decides to impress the handsome boy by becoming an adventurer herself, much to the shock of the king and queen. The game begins with Elise arriving at the first town outside of the castle walls and Nero, the kings assistant watching her from the shadows. When Elise arrives at a new town, typically she'll have to complete several quests before she can move on. Either finding items or killing a certain type of monster. This is usually done out in the field, though there are also 3D dungeons to explore later in the game. Venturing outside of the town takes you to the map screen. Each town has a small area next to it for Elise to explore. These areas are made up of different types of terrain and it's here the princess encounters monsters and finds items. 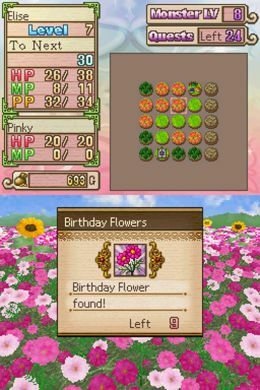 Should your quest require you to find flowers, for example, you'll need to head to a flower garden terrain. Once there, you can search the area by tapping the A button, you'll either find an item or (more likely) have to fight some monsters. Combat is turn based, that is, you choose your attack or magic spell and cast it, then the computer characters choose theirs. Disappointingly we never get to see the princess or her shape shifting pet blob Pinky, whom she meets shortly after completing her first quest, actually fighting any monsters. Instead the monsters just jump at the screen and chip away at your hit points. The biggest selling point of My World My Way is the pout system. By pouting, Elise can call upon special magic to change certain parts of the game. She can change the type of terrain if she's looking for a specific item, as well as adjusting how strong the monsters are or how much treasure they drop. There's even the option to skip some battles entirely if they are too annoying. According to the press release we got for the game the pouting system would mean an end to grinding (RPG gamer speak for constantly fighting monsters in order to advance your characters statistics) and boring fetch-quests. In reality however, this isn't the case, as we'll explain later. Exploring out in the field quickly tires out the inexperienced princess and you'll frequently have to return to town to rest. Meals can be eaten at the Inn, for the kinds of prices that would make a top london restaurant look cheap. Equipment is also expensive, especially magic potions (that restore your spellcasting power). The best way to restore your characters is to simply rest until the next day, when you'll have to go out and hunt monsters all over again. If you're defeated by a monster, you'll have to sacrifce half your days experience or some of your gold, unless you have the pout points left over to avoid this.